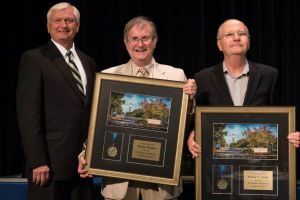 Old photos, fond memories and plenty of laughter were on the agenda as Pensacola State College recently recognized 97 employees at the 2017 Annual Service Awards Ceremony held in the Jean and Paul Amos Performance Studio. Retiring Physical Sciences Department icons Ed Stout and Wayne Wooten were celebrated with PowerPoint presentations highlighting their many accomplishments – as well as some old photos that showed off their changing tastes in fashions and hairstyles. Both joined the college family in 1974 with Stout teaching chemistry and then chairing the Physical Sciences Department, while Wooten began as director of the planetarium before teaching astronomy and spearheading the Escambia Amateur Astronomers Association. President Ed Meadows summed up their far-reaching influence by noting the changes they had embraced over the years. 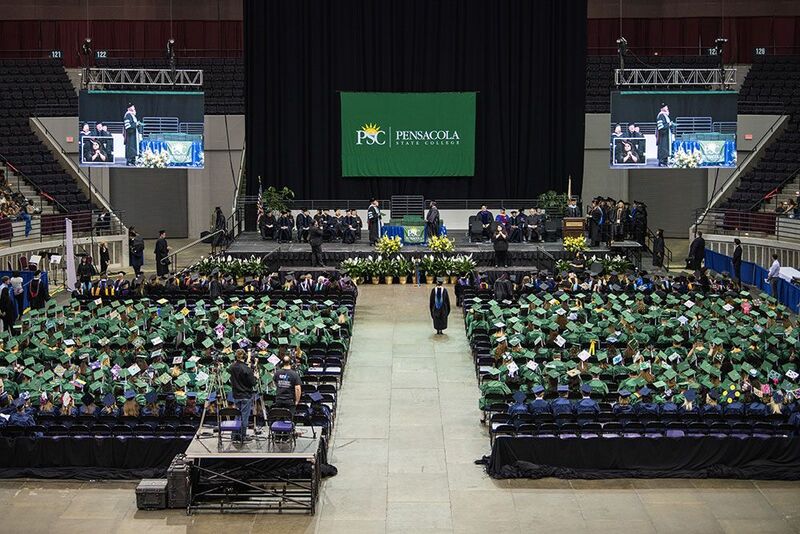 “When Dr. Stout and Dr. Wooten began their teaching careers, there were no computers in classrooms – they taught complicated formulas using chalkboards and slide rules,” Dr. Meadows said. “Over the years, as technology developed and programs grew, Dr. Stout and Dr. Wooten changed and grew right along with them. Special recognition for longevity also was extended to Records Coordinator Becky Johnson for 42 years of service and to Visual Arts Professor Bill Clover for 51 years in the classroom. Clover is the longest serving faculty member in the college’s 69-year history. Vice President for Academic and Student Affairs Erin Spicer presented the remaining service awards accompanied by photos and remarks about each recipient. Honored as 2017 PSC Legends for their 25 years of service were Pat Crews, Al Huffman, Linda Lambert, Kathryn Merritt, Jackie Padilla and Patrice Whitten. PSC colleagues were welcomed to the celebration with piano selections by Performing Arts student Troy Harris topped off with hors d’oeuvres by Shirley’s Deli and Catering. Planning the festivities were Tammy Henderson, Rhonda Likely, Melonie Miner, Erandi Sanchez-Perez, Virginia Santoni and Dykieria Stevens.